Here's a list of amazingly distinct and peculiar lobsters found from the different oceans of the world. Lobsters are found all over the world. Lobsters have 10 legs with the front ones adapted to claws. Lobsters are economically important as seafood, forming the basis of a global industry that nets US$ 1.8 billion in trade annually. 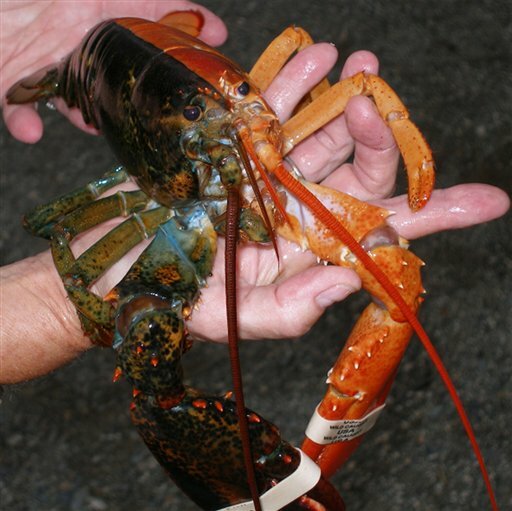 One of the weirdest and rarest kinds of lobster is the Half-and-Half Lobster. It was so named because it looks like the half is cooked and the other half is raw. It was caught in 2006 by a Maine Fisherman. Only 3 lobster of this kind had seen in the last 35 years. The chance of finding one is estimated at 1 in 50 million. Lobster shells are usually a blend of the three primary colors: red, yellow and blue. The colors mix to form the greenish-brown color of most lobsters. All split-colored lobsters observed havebeen hermaphroditic.